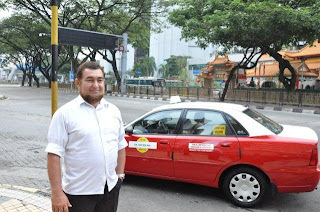 This is a picture of the guy who saved Kuala Lumpur for me. Bob. Bob used to do safety training for Oil and Gas companies. Offshore training. He taught water evacuation and water survival mostly. And he loved it. Not long ago, he injured his shoulder badly and now can no longer do this training. He drives a cab now in KL. He was born and raised in KL, and he clearly loves the city. He is very proud of it. There was a call to prayer when we were on our way back to the hotel and I asked him if that was what that was. He replied that it was, and that it was hard to answer that call when you drive a cab for a living. He was quick to add, with a sad face, that his religion does not condone violence of any kind and the things of the world now make him very sad. Bob has the kind of face that you believe. I told him there were extremists in all kinds of religions and they do not account for the rest of us. I can tell Bob is an interesting and complex guy, but for me, it is his kindness and humanity that changed the way I think about Kuala Lumpur. As I sat with my face in my hands, in the back seat of his cab, Bob asked me how it was that I had come to be in that area of town. I told him what I had been looking for and it appeared to confuse him as well. Then he asked why I was going back to the hotel. I told him that I was tired and I really did not want to try and figure out where to go next and what to do. That it had been too hard. Then he asked if I was too tired to try one more place…Central Market. He assured me I would not be disappointed. He even said he would give me his phone number, and I could call him when I was finished and he would fetch me. With that, I agreed to try it. On the way, he told me that it was a big market, to just go slow and not get overwhelmed. That there were many traditional artists in there, if only I would be patient. He asked me about my kids…about what I was doing in KL…and how long I had been there. It was a real conversation. I asked about him too and found out about his children, his divorce and his true love of a career that he could no longer perform in. But he said all this without any heaviness. He did not try and make it a sob story for me…the American tourist with dollars. The market was everything he said. I could have easily spent hours and hours in there. But it was late, and I really was tired. I spent almost two hours walking around and then called Bob. He came quickly and drove me back to my hotel. As we approached, he told me I should rest and then walk one block to the Pasar Malam that night, that operated on the entire street right one block from my hotel. The food was great, he said and the sights even better. As I got out of the taxi, I asked him if he would consider coming to get me in the morning to take me to place where I had to meet the bus in the morning. He agreed and told me when to be downstairs to ensure I got there in time. As I walked into the hotel, I realized that I was happy and not just because I had gone somewhere cool and had plans for the evening. I was happy because one person was not just nice to me…he was kind and honest. He represented something I had not seen yet in KL, someone who genuinely cared about my experience there. If you are going to KL, or know someone who is, let me know. I have Bob’s cell number and will give it to the you, provided I have assurance that whoever calls him will be kind and generous to him. He saved me. I owe him that much. People are awesome – sometimes. And, I guess they are all we have. Sometimes I think about that when I am in places that are amazing, but I am the only one there to see it. I wonder what it would be like to be the only person alive. It would be terrible. No food, or vista, or experience would really be enough.